The 2011 festival official opening was performed by Joan Kitching. Joan spent her formative years in Claremorris. 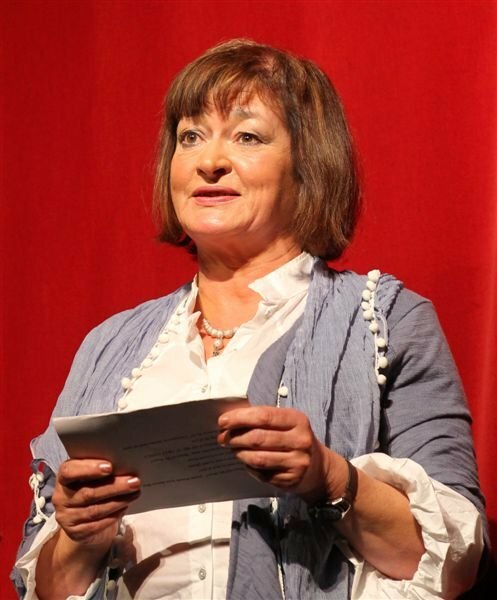 Shortly after joining Claremorris Players, Joan became one of the leading female actors on the Festival Circuit, winning many awards. She has given many memorable performances on the stage of Claremorris Town Hall. She was a member of the Claremorris All Ireland winning Production of “The Black Stranger” and of Charlestown’s “Buried Child”. Both wins brought with them, a weeks performance in the Peacock. Joan regards P.V O’Brien, Ray Leonard and Paddy Henry as mentors extraordinaire who taught stagecraft, whilst directing with genius. Joan’s Favourite roles were Bridie in “The Black Stranger”, Halie in “Buried Child”, Maria in “Lend Me a Tenor” and Maggie in “Big Maggie”. Joan is Founder member of Clann Machua Street Theatre Company, Kiltimagh Town Hall Theatre and Mephisto Theatre Galway. Joan served as chairperson of the Mayo Galway branch of the ADL and also served on the national executive. She holds a Masters Degree in Drama and Theatre Studies NUIG. We are delighted to have Joan to perform the official opening of our 41st Festival. This entry was posted on February 22, 2011 by Enda McCallig.